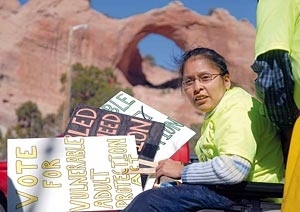 The Law Center's mission is to advocate so that the rights of Native Americans with disabilities in the Four Corners area are enforced, strengthened and brought in harmony with their communities. Our advocates work to ensure that Native Americans with disabilities have access to justice and are empowered and equal members of their communities and nations. The issues we address include civil rights, special education, health care, and rights to public and private services. Our staff investigates abuse and neglect in care facilities, and provides rights-based training for people with disabilities, their families, educators and service providers. We share a deep commitment to Native Americans with disabilities. We respect the individual, the community and the laws we seek to uphold. We value the histories and choices of the individuals and communities we serve. We are responsive to the needs of the community. We use resources wisely and ethically. We are transparent in our actions.